In the run-up to the General Election next Thursday, this year Emancipation & Liberation is devoting its annual May Day Greetings to messages of support from Ireland, Scotland, Wales and England for Steve Freeman who is standing as republican socialist candidate on an ‘internationalism form below’ in Bermondsey & Old Southwark (see https://www.youtube.com/watch?v=QfuPJcSwc6c and https://youtu.be/WuSFclgQ7BU). 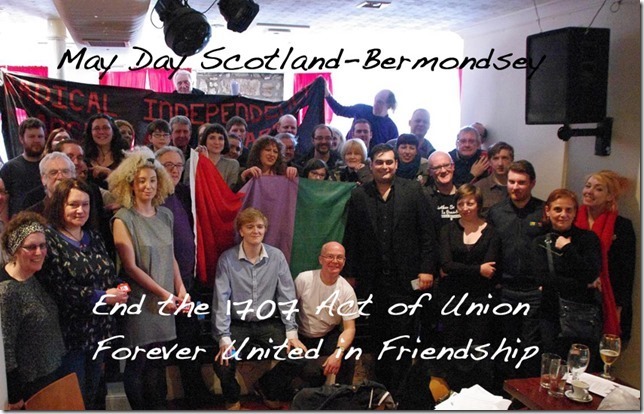 Speech given by Steve Freeman to the first Radical Independence Campaign (RIC) AGM in Glasgow on May 31st. Thank you to RIC comrades for inviting me – I bring greetings from republican socialists and anti-unionists in England. I am standing as a Republican Socialist and anti-unionist in Bermondsey, a working class constituency in South London. I am standing for real democracy and social justice. I made the final decision to stand when I met comrades in Edinburgh and asked for their support and got their enthusiastic backing. I will be the only anti-unionist standing in England. I believe it is absolutely vital and in the interests of England’s democracy and the people of England and the working class throughout the UK that the Acts of Union are abolished – forthwith – without hesitation – without deviation. We have to break the chains that bind England, Ireland, Scotland and Wales. It is not a matter of leaving it up to our friends in Scotland, Ireland and Wales. No – England has got to do its share of the heavy lifting. The left in England has to work out which side its bread is buttered on. Is it in alliance with the Scottish working class or is it in clinging on to the coat tails of the British ruling class? The left in England has worked out it is against the monarchy and House of Lords. But it has vowed to keep quiet and not make an issue out of it at the election. So the Tories can sleep easy in their beds – in their royal silk pyjamas. But when it comes to the Acts of Union the left in England trip over themselves, wander around in a daze and look puzzled. They seem to think Queen Anne’s bloody Act of Union is some form of proletarian internationalism. My central slogan against Westminster is going to be “Close it Down”. This is not just for Bermondsey, but Bristol, Belfast, Bangor and somewhere in Scotland beginning with ‘B’ (Aside to audience “help me out here comrades” – response from audience “Bathgate”!) Forty five per cent of the Scottish people vote to escape from Westminster. Escape is not an option for England. So “Close Westminster Down”. The Palace of Westminster is completely decrepit. It is sinking into the Thames. Leaks when it’s raining. It is a fire hazard. Chunks of masonry fall from the roof. On the 2nd March speaker John Bercow – “Decaying faster than it is being repaired”. What they haven’t told you in this election is that it will cost £3bn to renovate. After the election parliament will decide to spend your money without your permission. This Palace is “Not Fit for Purpose”. If you want to know how democratic Westminster is we can measure it years – how long do cover ups by the Crown continue before parliament gets to the truth? Perhaps our ‘democracy’ takes 25-40 years to find out. It was 25 years for the truth about the Hillsborough football tragedy. It is 40 years for child abuse scandals. We are still finding out about Iraq. Parliament is ‘Asleep at the Wheel’. So, what’s the answer? “Close it Down” and perhaps turn it into a “Museum of Victorian Democracy”. Abolish the Commons, Lords and Monarchy. Have a new parliament in the Midlands – Birmingham. Draw up a new constitution or “Agreement of the People”. Create the ‘Commonwealth of England’. Abolish all Acts of Union and elect a new republican parliament by proportional representation. I understand that RIC is a non-party campaign – it doesn’t take sides with any party in Scotland because that would undermine or wreck your campaign. But I am not standing in Scotland. There is no reason in theory why Nicola Sturgeon couldn’t support me. So I would appeal to all of you to give me the maximum support you can a) with money b) we might find a way you can endorse me/vote for me. Now I will get a low vote in Bermondsey – I have no party to support me on the ground. But if I can get 1000 people to support me across the country I can ‘win’ a moral and political victory. That would be your victory too. Together we can start to slay the lie that says the Scottish left are rabid or closet nationalists. Together we can show what proletarian internationalism means. “Hi Steve, you have my support. You cannot submerge the key issue of self-determination and a radical alternative for Scotland, with its implications for advancing the cause of English working class in a Left Unity analysis that describes that question as ‘narrow nationalism’. The likelihood of their candidate being elected to Westminster but for your intervention in the election is a bit delusional given the archaic election process for Westminster, but even if it were true Republican Socialists would be supporting a candidate who denies the legitimacy of our position and insults us into the bargain. The Scottish question has changed all that. Its impact on socialism on these islands is the key issue of this election. Austerity is the Question. 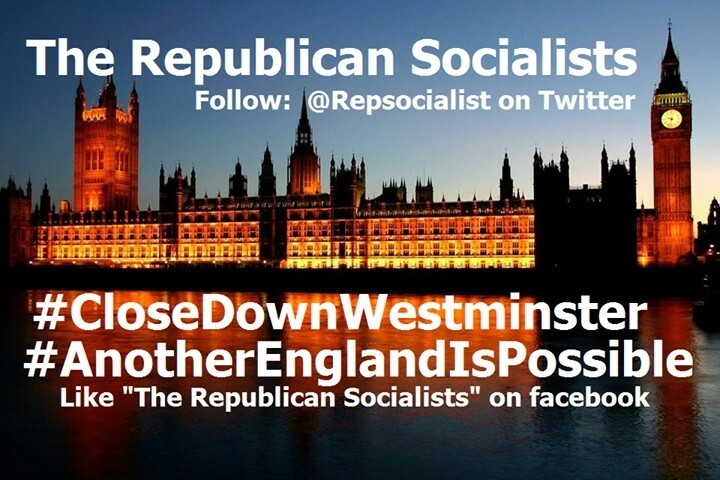 The Commonwealth of Independent Socialist Republics on these Islands in the context of International Socialism remains the only answer and that is a matter of self-determination not a devolution Trojan horse from an imperialist Westminster. Good luck with it. The only way is forward”. “Steve, breaking the Westminster consensus is crucial to giving people hope for radical social change. That is what defined the radical case for Scottish independence. Regardless of the tactical voting that an undemocratic first-past-the-post system produces, it is vitally important that republican socialists are out campaigning for an alternative to war abroad and austerity at home. “Steve, I am happy to support the republican socialist campaign. The idea that ‘Another England is possible’ is timely. With my family background from Barbados, the idea of a British identity connects with the idea of the British Empire which includes many nations. In contrast since the 1950’s Englishness has been an identity which has tended to exclude black and ethnic minorities.